A word about sponsorship. Sponsorship is two people with the same problem helping each other to work the program. Many SCA members are seeking sponsors to be part of their program of recovery. A sponsor may be (but not limited to) someone who has made some progress in sexual-recovery and shares that experience on a continuous, individual basis with a fellow addict. Would all those who are willing to serve as a S.C.A. sponsor, please let your meeting(s) know. In order to keep our recovery, it is suggested that we can help others through service. Chairing a meeting, sponsoring a fellow addict, or participating in local, regional or international positions are just a few examples of service. These actions can break our isolation, form community, meet the needs of SCA members and meetings, and ultimately help us stay sober. Consider making service a regular part of your recovery. 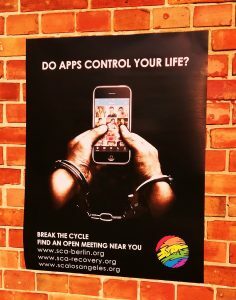 SCA Berlin Intergroup would like to send our best thanks to the 12 step outreach committe of SCA Los Angeles, and to all ISO Members who were engaged with that issue, to make it possible for us to use the outreach-poster for public information in Berlin. We appreciate your support a lot!